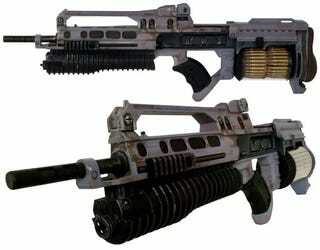 Just like the game itself, Killzone 2's guns are big, loud and dirty. The Helghast's StA52 Assault Rifle is particularly big, particularly loud, and, yes, dirty as well. Would you like one? Because Sony are giving some away. Big, heavy, replica models of the in-game weapons. For the first 14 days of March, Sony will be trawling Killzone 2's online leaderboards, and picking winners across a range of categories in both singleplayer and multiplayer game modes. There's one a day to give away, and they'll probably be worth a buck or two since Sony also say they won't be available in stores.